A week before Acquia Engage event, I received an email from Ashish Goyal (Global Sales Head) who asked me if I could join him on Acquia Engage event this year. 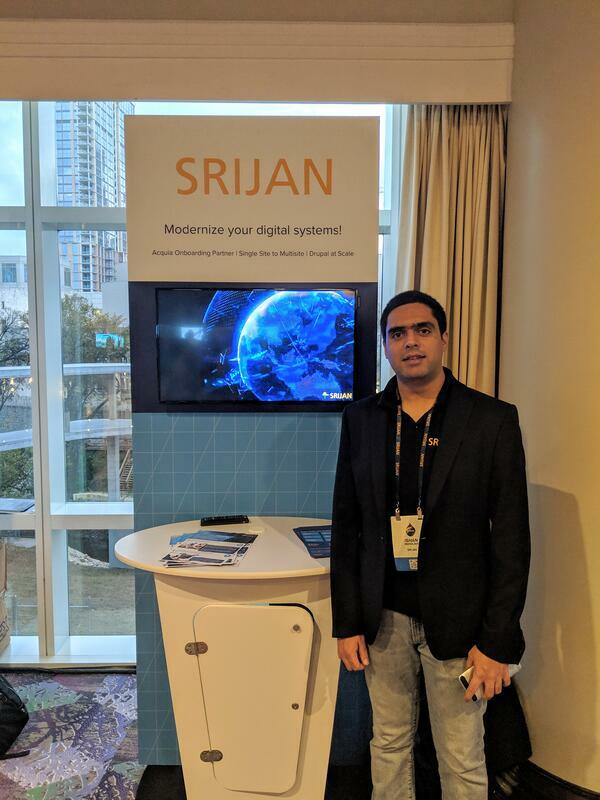 The excitement to get out and meet fellow Srijanites in an event that would give me a chance to dig deeper in Acquia and Drupal offerings sounded like an excellent idea! So, I decided to pack my bags to fly to Austin, Tx. So buckle up as I take you with me along with my journey..
What is Acquia Engage ‘18? Engage Hub Event app was another amazing tool that gave me up to date information about the speakers, attendees, award winners (To be honest - knowing the winners from start took away the excitement a little), the raffle and learned that we (Srijan) were in fact one of the sponsors of the event too! Hah!! Small world. Two people sitting on seats ahead of me are also going for #acquiaengage. Overheard them while they were discussing personalization and drupal. With a sponsor’s pride in my heart, I left for the event and was ecstatic to find out that two Drupalers sitting in the row in front of me were also on the same journey where Senior Drupaler was giving some knowledgeable insights in how personalized content is a powerful marketing solution to connect better with the customers to their junior counterpart. It was enough dose to get me excited about the event more! First day, Ashish, Ishan and I met and together went to attend the pre-conference social & reception at the Fairmont Hotel in Downtown Austin where we setup our Kiosk for the actual event day and enjoyed a wonderful dinner hosted by Acquia. Though we didn’t win this year but did feel great to see the winners and their projects. Kudos to winners! Well deserved! Day 1’s Mantra - Build Manage Optimize! Enterprises that are focusing on building good digital experiences are far ahead of the competition who are still trying to manage the content. Rest of the day went in networking, attending events about various solutions including Lighting, Decoupled Drupal & progressively decoupled architecture etc. Got to learn about Acquia’s Site Factory, Lift, Journey, DAM & Cloud solutions and how important this product suite can be for any enterprise in building digital consumer experiences quickly while without worrying about scale. And to hear some of the excerpt from his actual talk, you can refer to this tweet here. His talk was witty, moving, inspirational and powerful that I could see a lot of grown up men & women shed tears with sheer excitement and surge of emotions that we all experienced in that talk. Eric was humble enough to compare his challenges with those experienced by us as IT professionals while building a better world. Finally after day 1 ended, Acquia once again graciously hosted a party for all the attendees at SpeakEasy lounge (Austin, Tx Downtown) and to all our surprise Wendy's had a surprise dinner for us at 9PM along with few more coupons! My next day started with more learning, networking and meeting fellow drupalers and various healthy and insightful discussions on WordPress Vs Drupal, Progressive web apps, GraphQL, fully decoupled vs progressively decoupled architecture. We got to learn more about some of the prime sponsors, award winners and their stories. Even though I didn’t get to win the Raffle organized by Acquia, it was great networking opportunity to connect with with all the sponsors at their kiosk and taking picture of their logo (Clever idea by Acquia event team to force attendees to visit each sponsor). Inspired by Acquia’s raffle, Ashish also decided to host a raffle by Srijan where he decided to give Apple Watch Series 4 and thanks to Alec Buchbaum of Acquia we were able to pick Dan Ardelan of @elevatedthird as the lucky winner! After that, the focus was to pack bags for home while thinking about all the learning from the event. It was a wonderful 3 days journey where we got to learn, network and have fun at the same time! This journey convinced me that even though WordPress beats Drupal in CMS market share at the end it doesn’t matter when we are trying to solve problems for marketers. It showed me that Acquia’s experience platform along with power of open-sourced Drupal can be a very powerful and essential solution for an enterprise of any level in building meaningful consumer experiences quickly. In the end, I would like to thank Acquia and various sponsors for making this event a huge success and of course, Srijan for giving me the opportunity to attend one. Can’t wait to be in next year’s Engage!